J.O. 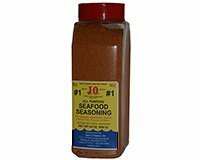 #1 All Purpose Seafood Seasoning is a Maryland Style spice blend for seasoning blue crabs, seafood, vegetables, salads, french fries and more. Use on just about any food you want to spice up. J.O. Seafood Seasoning is a blend of Salt, Spices, and Paprika. Ingredients: Salt, Spices and Paprika. For every pound of shrimp, and 1 level tablespoon of JO #1 Seafood Seasoning, 1/4 cup of vinegar and 1/4 cup of water. Mix ingredients together thoroughly, pour over shrimp and steam shrimp until pink. Carefully pick through crab meat, trying not to break up lumps, for any pieces of cartilage and set aside. Remove crust from bread and break into small pieces about 3/8" (10 mm) in size. Blend rest of ingredients together and carefully fold in with crab meat.